In the second quarter of 2018, one in which the global economy was shaken by the rapid escalation of Trump's trade war, and in which central banks were one after another hinting at their own QE tapering and rate hiking intentions to follow in the Fed's footsteps, what was really taking place was another central bank buying spree meant to boost confidence that things are now back to normal, using "money" that was freshly printed out of thin air, and spent to prop up risk assets around the world by recklessly buying stocks with no regard for price or cost. Nowhere was this more obvious than in the latest, just released 13F from the massive hedge fund known as the "Swiss National Bank." What it showed is that, just like in the prior quarter, and the quarter before that, and so on, the Swiss central bank went on another aggressive buying spree and following a modest selloff in the first quarter which was a mirror image of the SNB's buying spree during Q1 2017 - the Swiss central bank boosted its total holdings of US stocks to $87.5 billion, up 6.6% or $5.4 billion from the $82.0 billion at the end of the first quarter, and just shy of their all time high. 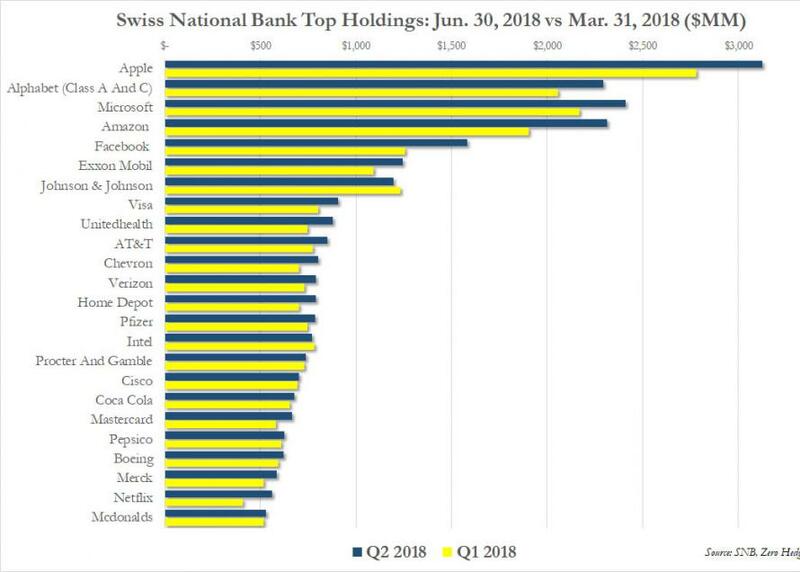 Some notable observations: in the second quarter, after the SNB printed money out of thing air, it then added 4.85 million shares of AT&T, 673K shares of MSFT, 305K shares of AAPL, 272K shares of FB, 46K shares of AMZN, 423K shares of XOM. 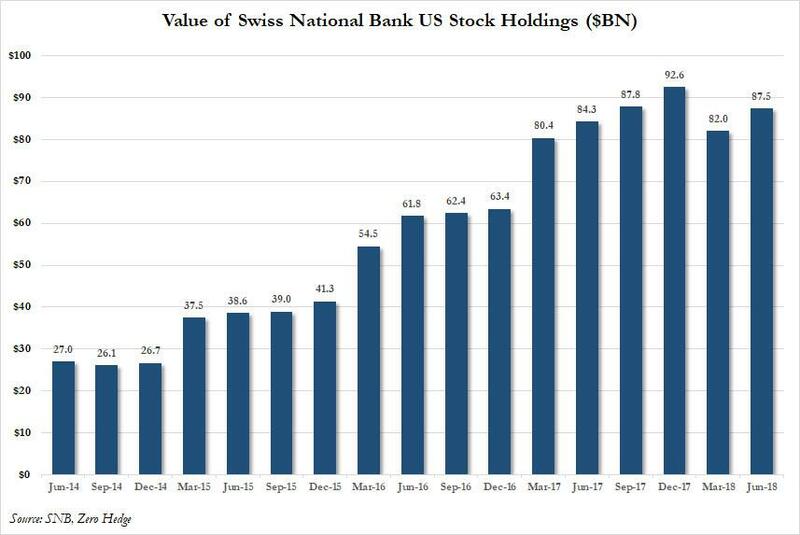 And according to some calculations, the SNB's portfolio now generates over $1 billion worth of dividends, or as @SheepleAnalytics notes, "they print money and we ship them our profits." And while we have yet to learn if Warren Buffett was actively frontrunning the SNB once again during the quarter by buying even more AAPL shares, something the Berkshire 10Q suggested is very likely, a look at the SNB's holdings of AAPL stock shows that after some modest selling in the first quarter, in Q2 its AAPL holdings again increased modestly from 16.570 million to 16.874 million shares, making the SNB a larger holder of Apple than Franklin Resources, Dimensional and the State of New York (with 16.7, 16.2, and 14.1 million shares respectively), and just behind Janus with 19.4 million shares, demonstrates one of the main reasons why the Nasdaq has continued to hit new all time highs on a daily basis for much of 2018. The chart above also explains why unlike Morgan Stanley, which for the past month has been urging clients to exit their tech holdings, Goldman Sachs remains bullish on tech stocks and the Nasdaq: after all, when a central bank can and does create money out of thin air, then splurges on the handful of tech companies that have the biggest impact on the broader market, pushing both the Nasdaq and all indices higher, what is the point of even talking about "risk"?